Discover the historical highlights and lush countryside of what's known as the ‘Heart of England’ on this 5-day tour from London. On one of the best tours of England available, travel by air-conditioned coach to see the university architecture of Oxford, explore William Shakespeare’s Stratford-upon-Avon, and experience the enchanting Cotswolds before visiting the Georgian city of Bath and Wiltshire’s Longleat house and prehistoric Avebury Ring. Four nights in 3-star hotels are included, as are many meals and attraction entrance tickets. Numbers are limited to 15 for a more personalized experience. Your tour includes four nights’ of 3-star accommodation: two nights in a hotel in the Cotswolds and two in Bath, as well as daily breakfast and dinner. Round-trip transport by comfortable air-conditioned coach with an expert guide, plus entrance fees to many attractions, including Anne Hathaway’s Cottage, the Roman Baths in Bath, and Longleat and the Avebury Ring are also included. Leave London by minivan and head northwest out of the city, passing through the beautiful English countryside. First stop is Oxford, England’s world-famous university city. Enjoy a leisurely paced stroll with your guide, admiring the city’s golden-colored buildings and ‘dreaming spires.’ Head inside one of the University of Oxford's iconic colleges and hear about the legendary scholars who have studied there. After a break for lunch in town (own expense), head into the scenic Cotswolds by minivan, stopping in the town of Chipping Campden where your overnight accommodation awaits. After dinner in your hotel, spend the rest of your evening at leisure. Leave the Cotswolds after breakfast to visit Stratford-upon-Avon, a beautiful little market town famous for being the home of English playwright William Shakespeare. On a walking tour, visit Shakespeare’s burial site at Holy Trinity Church. 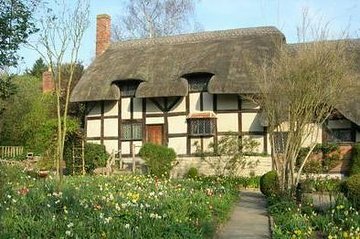 After a short drive to the neighboring village of Shottery, take a look inside the rustic thatched cottage that once belonged to Anne Hathaway — Shakespeare’s wife — and see intriguing relics from her time. Stop for lunch (own expense) and then spend the afternoon traveling through the Cotswolds’ winding roads. With plenty of stops, your afternoon excursion shows off the gorgeous hamlets, churches and quintessentially English countryside for which the Cotswolds are so well known. The villages visited vary by tour, but usually include the so-called ‘jewels of the Cotswolds’: Snowshill, Bidford-on-Avon and Broadway. Return to Chipping Campden in the late afternoon, and spend your evening at leisure. Check out of your hotel after breakfast, and then travel to the picture-perfect village of Lacock in Wiltshire. Featured in countless scenes for hit British television dramas like Pride and Prejudice as well as several Harry Potter movies, the village is a bastion of ‘Englishness’ with traditional cobblestone streets and half-timbered houses. Spend time at leisure exploring, and then meet your guide for a tour of medieval Lacock Abbey. In the afternoon, continue to Castle Combe and stroll through the quintessentially English village with your guide. Then, savor a delicious cream tea in a local cafe. Travel by minivan to the nearby spa town of Bath and spend your night at leisure after checking into your hotel. Enjoy a leisurely breakfast in your hotel and then meet your guide to see the best of this vibrant Georgian city. A UNESCO World Heritage site, Bath has the highest concentration of ‘listed’ (historically significant) buildings in the British Isles. Learn about Roman life in the city on a visit to the Roman Baths, and marvel at the city’s towering 15th-century abbey — officially known as the Abbey Church of Saint Peter and Saint Paul. Other highlights such as a magnificent town house at Georgian Royal Crescent and elegant Pulteney Bridge are also visited on your tour. Spend your afternoon at leisure, perhaps finding a cafe for lunch or visiting the Jane Austen Centre (own expense) for a snapshot of the author’s life during Bath’s Regency era. In the evening, join your guide and group for a farewell dinner at your hotel. After an early breakfast, check out of your hotel and leave Bath for your final day of sightseeing. Your first stop is Longleat, an English stately home that’s currently the seat of the Marquess of Bath. After a tour of the house, seeing some of Lord Bath’s personal murals, your tour continues to the village of Avebury to visit the UNESCO World Heritage site of Avebury Ring. The standing stones rival Stonehenge as the largest and most complex prehistoric site in Britain. Walk freely amongst the stones, and pose for photos before returning to London.